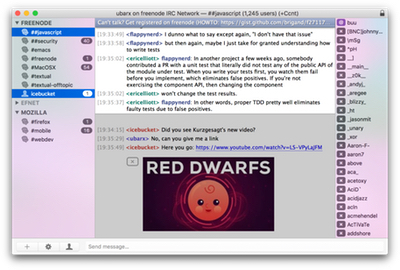 with Internet Relay Chat (IRC) chatrooms on macOS. Requires OS X Mavericks (10.9) or later. 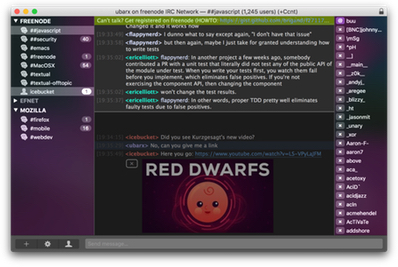 Textual includes two elegantly designed dark and light variants of the user interface which have been refined all the way down to the very last pixel. Textual supports very powerful modern technologies such as native IPv6, the latest IRCv3 specifications, client-side certificate authentication, and much, much more in a easy to navigate, clutter free environment. Textual protects your privacy by leveraging widely accepted, proven technologies such as Off-the-Record Messaging (OTR) to ensure that the only people reading your conversations are those that you intend to. Textual takes customization to the next level with styles created using well documented, open standards in addition to addons built using a multitude of programming languages such as AppleScript, Objective-C, PHP, Python, Perl, Ruby, Shell, and Swift. Copyright © 2019 Codeux Software, LLC.